he Transport Workers’ Union has been the collective voice for the men and women working in the Australian transport industry since the Victorian Carters and Drivers’ Union – which became the modern TWU – was established in 1900.From humble beginnings, the TWU now represents over 90,000 employees and owner-operators nationally across a wide range of industries, including aviation (pilots, ground services, catering and guest services), oil, fuel and gas, all aspects of road transportation and freight logistics, the private bus industry and waste management.Our role as a union has always been to secure the best pay, conditions and safety standards for each and every one of the men and women who are the backbone of the Australian economy. Our collective power has helped create real change within the lives of not only transport workers, but also their families and the communities they live in. The first recorded road transport unions in Australia were the Coal Carters Union and the owner-driver Melbourne Carriers’ Union. Both had folded by 1883. The Coach Drivers’ Union, established in 1885, was the first attempt to cover passenger vehicles but it too folded in 1890. It was apparent the fledgling organisations were unable to survive the harsh economic depression and hostility from employers and governments through a period until 1900 when unions had no legal basis for existence. 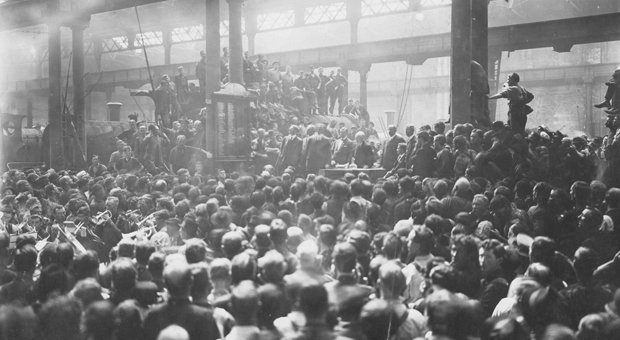 In fact, the working and living conditions faced by trolley men, draymen and carters were so bad that most slept at night in the carriages they worked 15-hour days, mostly to be paid in food.In 1890, however, transport workers were drawn into the great Maritime strike and over 300 drivers and draymen formed the United Drivers Union of Victoria.Membership swelled to 692 at the apex of the struggle but the strike was defeated and, by May 1892, the United Drivers also folded. However, the infraction proved organised workers could have a powerful industrial and political voice in the colony. The establishment of wage boards in 1896 and a federal conciliation and arbitration system in 1904 – by the world’s first Labor government – laid the foundation for the growth of the union movement in Australia. The TWU played a vital role in building this future. The first members organised to fight for safety on the job and reasonable wages and conditions. They are the same reasons – with the addition of protecting hard-won gains – why members over the years often renew the struggle. The Victorian Carters and Drivers’ Union (FCDIU) established. The FCDIU was the catalyst that bonded mostly fragmented and localised road transport unions at the time into a united national Union. The turning point came when the FCDIU sought and obtained federal registration in 1906. The Union’s first Federal Award granted. The Australian Road Transport Workers Union established with return of NSW Branch who had split from the FCDIU several years earlier. The TWU wins the right to cover workers in air transport and consequently changed its name to the Transport Workers’ Union of Australia. Two weeks’ paid annual leave awarded for the first time. 40-hour week introduced. National membership rose from 20,234 to 36,999 in 1947 due to Australia’s post-WWII industrial expansion. Award covering interstate drivers established. TWU’s industrial coverage expands further into the bus, aviation and dairy industries. The TWU is again the centre of events which shake the labour movement. The Moore v Doyle case in the Commonwealth Industrial Court upholds the right of the TWU to represent owner-drivers. The Fraser Government legislates a new provision into the Trade Practices Act – Section 45D which outlawed conduct that “hinders or prevents the supply of goods by a third party to a corporation”. Most TWU members, however, who hauled goods between two corporations while often being employed by a third were particularly vulnerable. This period climaxed in 1980 with the so-called Laidley dispute. After 10 days of strike action which spread nationwide, the Union triumphed with a new agreement which spread award coverage to oil agents and contractors. Owner-drivers stage the Razorback blockades to highlight their campaign for the abolition of the NSW Road Tax and increased sub-contract rates. TWU members win the battle to have their own industry occupational superannuation fund with the creation of The Transport Workers (Superannuation) Award 1986. The Transport Workers’ Union pioneered industry superannuation fund was the first of its kind in Australia. Since the funds inception, the Branch has been successfully fighting for employers’ to agree to pay more into member accounts. TWU amalgamates with the Motor Transport and Chauffeurs’ Association, giving the Union coverage of the private bus industry in Victoria. TWU members unanimously reject a proposal to amalgamate with the National Union of Workers. TWU amalgamates with the Federated Gas Employees Industrial Union. 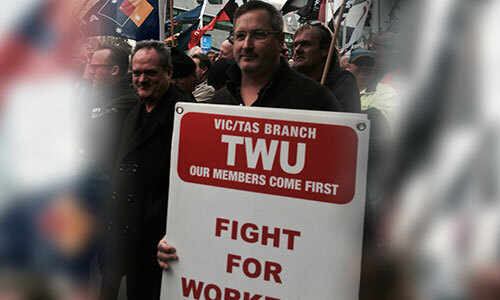 Victorian and Tasmanian Branches of the TWU merge. The Union continues to fight for decent and fair Australian aviation jobs in the wake of the 2011 Qantas industrial disputes. Members vote to accept the first nationwide Toll EBA. The 20-year ‘Safe Rates’ campaign culminates with the passing of ground-breaking legislation to establish the Road Safety Remuneration Tribunal. Then Vic/Tas Secretary Wayne Mader hailed it as a milestone not only for the Union and its members but the entire labour movement. John Berger is elected unopposed as the Victoria/Tasmania Branch State Secretary.